Yes! You can turn your PC into a WiFi Hotspot to share your PC's Internet Connection with other Computers and WiFi supported mobile phones. Most of you knows to use Internet on your Computer and how to tether with your Android Phone. But you might not know that reverse tethering is also possible. Yes! You can share your PC's Internet Connection with your Mobile Phones and other PC which have WiFi connectivity. A PC with Internet (must have WiFi or a WiFi Dongle). My Public WiFi Application. I will share the link to download it, but little later in this tutorial. PC or Mobile which can receive WiFi signals. If you have the above three things than you can turn your PC (Windows) into a WiFi HotSpot. Yeah! You can use your PC as same as what WiFi HotSpot does. Actually, you will make a Virtual Wireless Network. Let's see the tweak now. 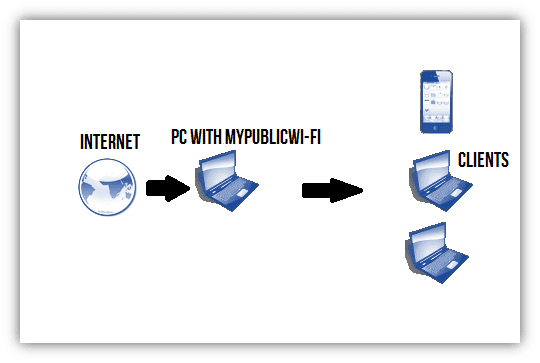 We will use MyPublicWiFi Software to setup Virtual WiFi Network in our PC. Anyone nearby your PC can use it to surf Internet. It is simple to use software. Look at some of the features, you'll get with it. You can protect your Virtual WiFi network with a Password and everyone who want to use your PC Internet will have to know the pass key. Survey and see the list of URLs browsed using your Virtual Wireless Network created by MyPublicWiFi. You can also see the I.P. address, device name and MAC address of the connected device. You can turn your PC into WiFi HotSpot with these simple steps. First download the Software from here and install it on your PC. Open the Application and choose a network name and protect it with a Network Key (Password). 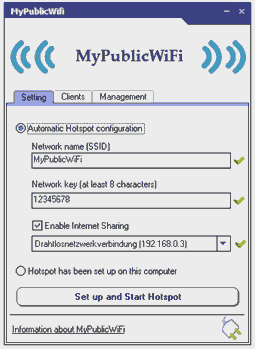 Enable Internet Sharing and Start your HotSpot. If you want to stop your Virtual HotSpot than click on stop hotspot. That's All! You can now connect your other PC and smartphones with the newly created Virtual WiFi Hotspot. Enjoy sharing your Internet.